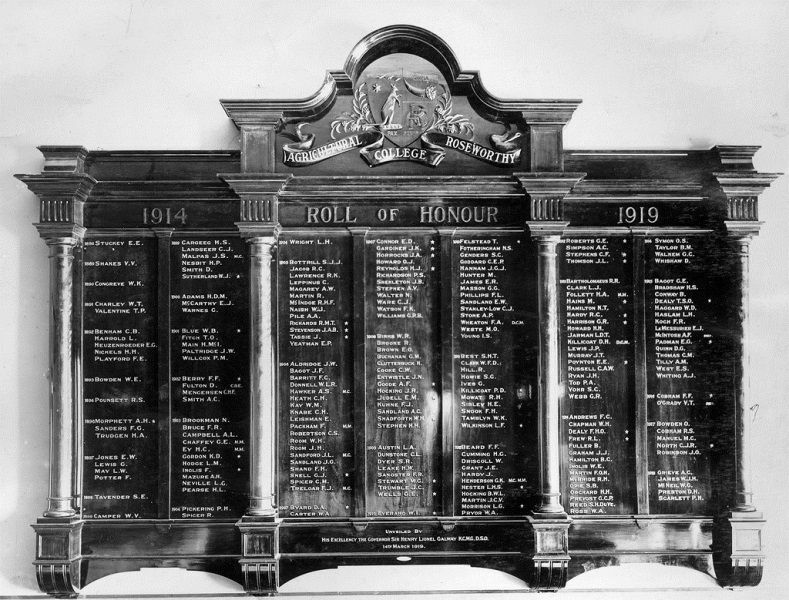 An Honor roll, containing the names of the men who enlisted from the institution for active service, was unveiled by the Governor (Sir Henry Galway) at Roseworthy College yesterday on the occasion of the annual speech day. The Governor, in unveiling the roll of honor, said such occasions always served to remind them of the lasting obligation they were under to their fighting men, on land, sea, or in the air. The roll would stand as the hallmark of service and would constitute, as it were, a tradition for Roseworthy College. A tradition which it should be the aim of future students of the college to keep bright and zealously guard. The war record of the college was one to be proud of. Out of the 227 who enlisted, 43 made the supreme sacrifice—no less than 19 per cent. To the relatives of those brave and devoted men, their hearts go out in profound sympathy. Daily Herald (Adelaide), 15 March 1919. Unveiled by His Excellency the Governor Sir Henry Lionerl Galway K.C.M.G., D.S.O.